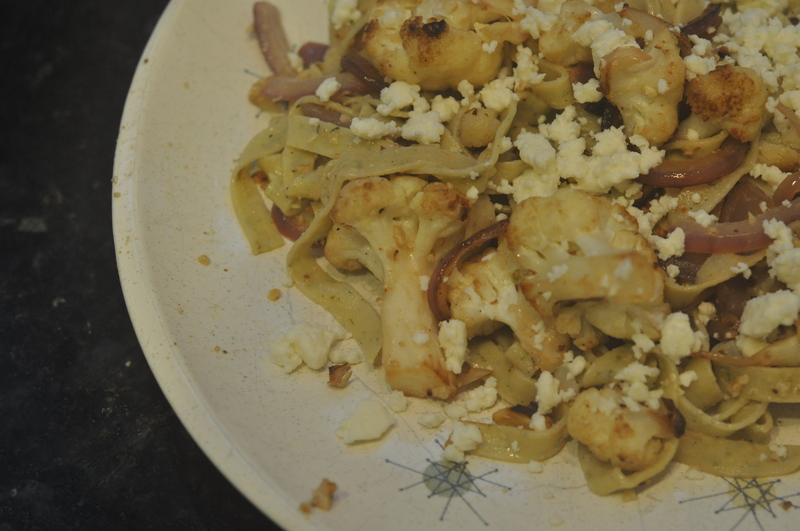 For a couple of months now I’ve been fiddling with a recipe for pasta with cauliflower, walnuts, and feta that I came across at Smitten Kitchen. Deb, that site’s cook and author, had initially found it in Alice Waters’ Chez Panisse Vegetables. 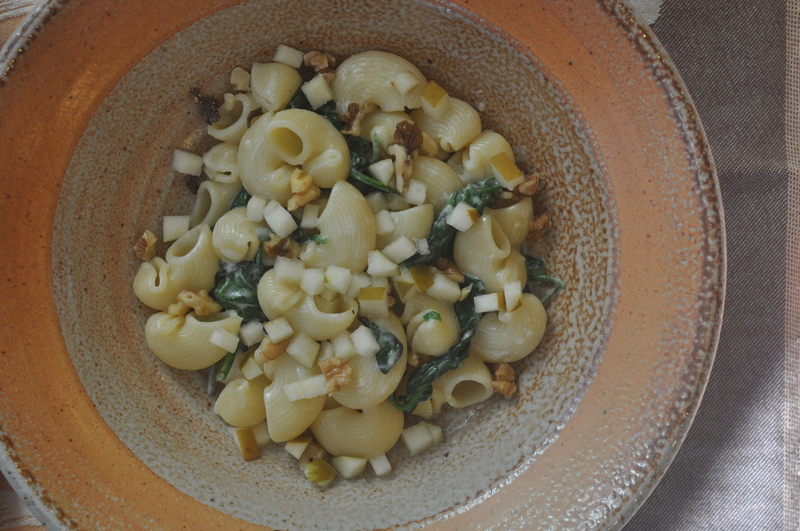 It almost seems like a dish born of necessity — as if Alice Waters, in the midst of a snow storm, had opened the refrigerator to find a head of cauliflower and some feta, pulled the last walnuts and some pasta from her pantry, and made a meal of it. Of course, Waters lives in Berkeley, California, where it doesn’t snow, and even in a storm her kitchen would surely be well-stocked. In any case, The Professor and my preschooler both like pasta, cauliflower, walnuts, and cheese, so I figured it was worth a try. And indeed, The Professor never failed the dish. Though he has, shall we say, offered constructive criticism. First, the recipe calls for whole wheat pasta, which he just couldn’t get behind. The next time I made it with white pasta, which was, all agreed, too bland. Most recently I made it with a fresh cilantro lime pasta. The quality of the pasta matters a lot in a vegetarian pasta dish, we decided, and the high-quality fresh fettuccine definitely improved the meal. But any cilantro-ness just disappeared into the sauce. Yes, the sauce. That was the second big change. I decided we needed something to bind the ingredients together. So I whirled some some feta, walnuts, and a touch of olive oil in the food processor; and tossed that with the pasta before adding the cauliflower, onion, and walnut mixture. The Professor liked the sauce. I ignored the comment about the cauliflower. I had to. I’d been working on this dish for months. 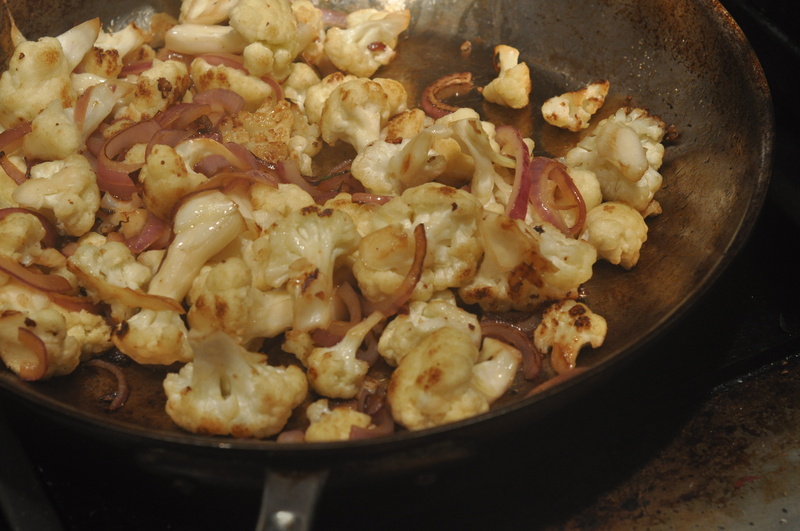 I’d been trying to perfect roasted cauliflower for more than a year. I’d served The Professor cauliflower in myriad forms over our years together and now … now he was suggesting that the cauliflower tasted too much like, well, cauliflower?! Instead, I heard “heat” and “green.” And next time he’ll get that. Although I may wait until autumn — peak cauliflower season. I think The Professor needs a break. I realized, as I was writing about grilled salmon yesterday, that my recipe for Udon Noodles with a Soy-Ginger Sauce was buried in a post about tofu! I could hardly find it and I knew it was there. So I decided to re-post it. While a big pot of water is heating up, prep the garlic, ginger, scallions, mushrooms and cabbage. When the water is boiling, add the udon and a generous handful of salt and set the timer for 6 minutes. Heat a wok or frying pan, then add oil to coat. 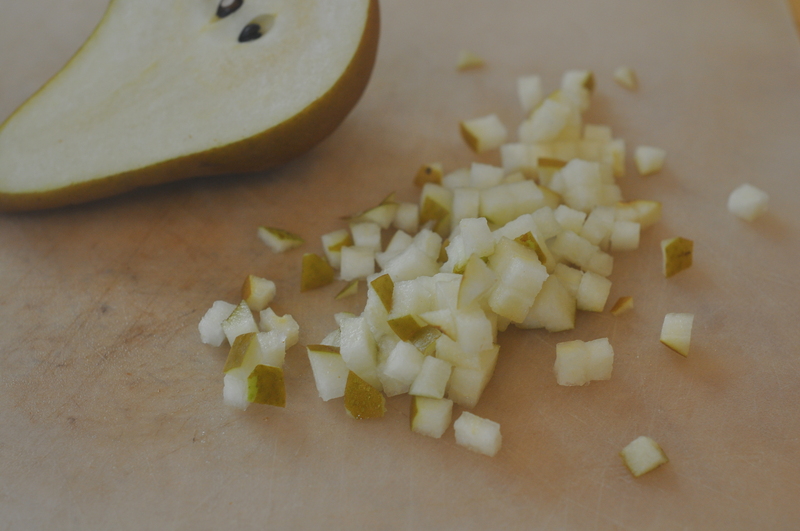 When the oil shimmers, add the garlic and ginger and cook, stirring frequently for 30 seconds. Add the mushrooms and toss to coat with the oil. Sprinkle with salt and cover. Take off the lid every minute to stir and check the mushrooms. If they are done before the noodles, turn the burner off. When the timer goes off, rinse the noodles in cold water. They should be a bit undercooked — chewy but not crunchy. Push the mushrooms to the sides of the wok or pan, add the sauce and turn the heat to high. Add the noodles and the cabbage and toss for 1-2 minutes or until the cabbage is warmed and the noodles are coated in sauce and fully cooked. Turn off the heat and mix in the scallions. A few weeks ago, The New York Times‘s Mark Bittman wrote a column called “Pasta Primavera: The Remix.” Bittman explained the back story of the dish, how the name means “spring pasta” and that it was invented in the 1970s by Sirio Maccioni, the owner of the New York mainstay Le Cirque. And he, Bittman that is, goes on to offer several new and more interesting approaches to the dish. I should say now, that I’ve never liked “pasta primavera” and wouldn’t have considered serving it to The Professor, who doesn’t really like the concept of vegetarian pastas. But one night last week, I came down to the kitchen without a solid plan for dinner. I opened the refrigerator, rifled through the drawers, and found a bunch of kale and some asparagus. I knew I had peas and walnuts in the freezer. 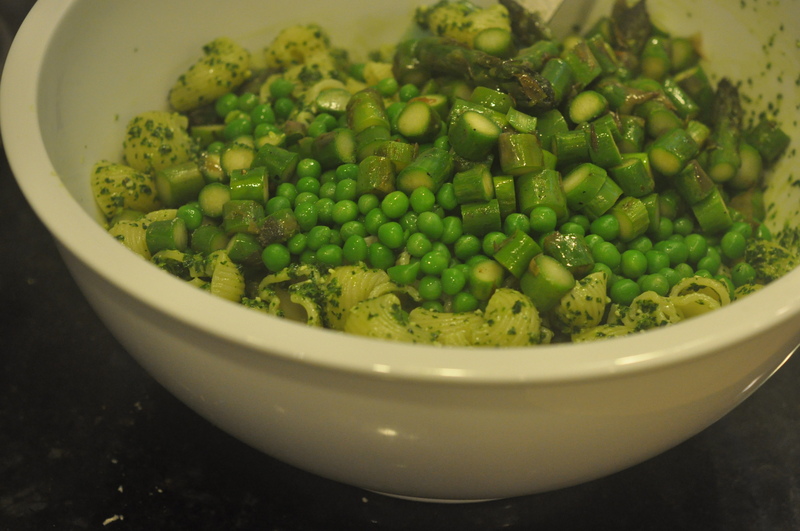 So, with Bittman’s inventive spirit in mind, I served a “pasta primavera” made of peas, roasted asparagus, and a pesto of kale and walnuts. 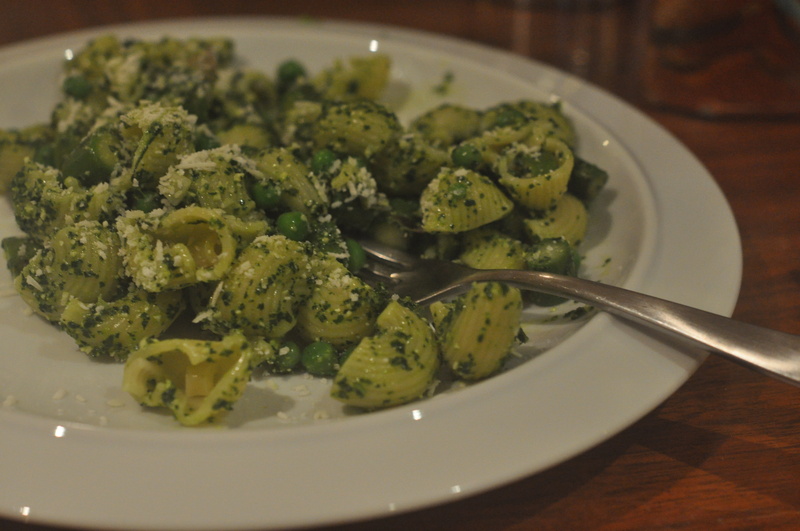 And, of course, pasta — I served it with a short, shell-like pasta that would catch the pesto and other yumminess. The Professor loved the mixture of flavors and textures. The nutty, earthy richness of the pesto. The sweet pop of the peas. 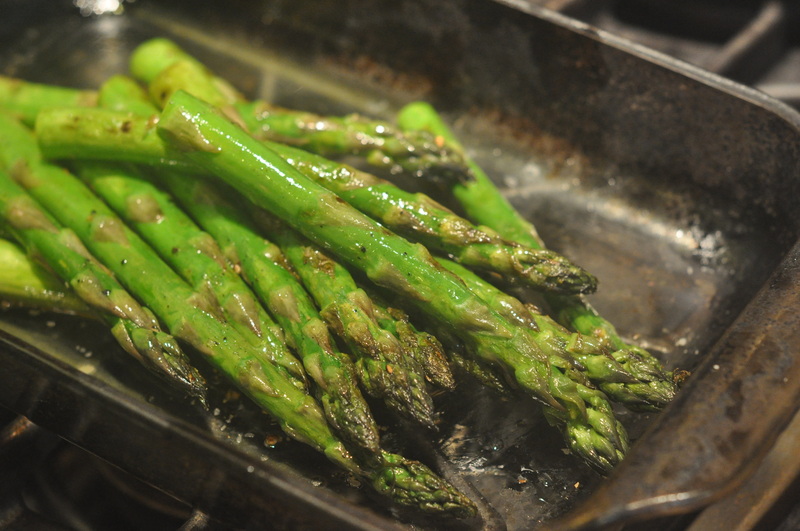 The bright crispness of the asparagus. 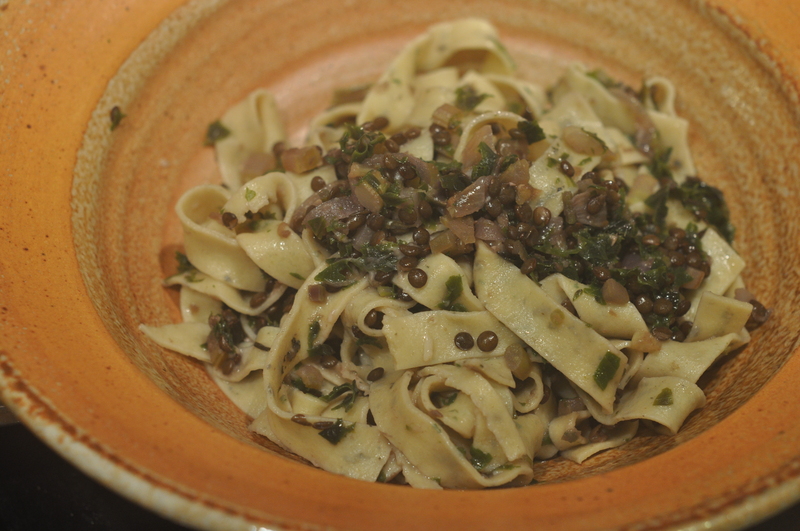 The result: The Professor gave the dish a B+, saying, “I like it better than other vegetarian pastas we’ve tried.” He loved the taste and “interestingness,” faulting it only for it’s ability to completely satisfy. What can I say? I’ll work on it! I’ll also keep track of the measurements next time so that I can post a recipe. The search for a vegetarian version of my udon noodles with a soy-ginger sauce continues. A quick recap: The pescatarian version of my udon noodles — topped with roasted salmon — earns an A from The Professor. But I’ve been trying to develop a vegetarian version. 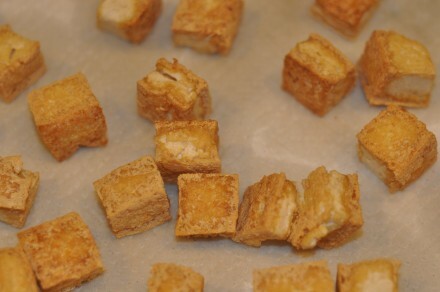 For my first attempt, I used fried cubes of tofu bought at Whole Foods, but the cubes were too big and required cutting. Early in our marriage, when I was still passionate about our wedding presents, I would have jumped at the opportunity to use the new steak knives. But, while I still love the knives (thanks again, Ruth and Andras! ), using them to re-cube the tofu mid-meal was a drag. Again, I sliced the brick of tofu in half the long way and pressed out the excess water. I let it sit in a marinade of soy sauce, mirin, garlic and ginger. And then I baked it at 375 degrees for 20 minutes. And then another 5 minutes. And another five. I kept hoping that the tofu would start to crisp! Eventually I gave up and served it. The result: the tofu was definitely tasty and brought more flavor to the dish than the unseasoned fried versions I’d already tried. But it was also spongy. It lacked any crispness. So the search continues. But I am optimistic, in part because my friend Joanne, who doesn’t cook, offered up her fiance, who does. I’m hoping to get a lesson in frying tofu from Sean soon. 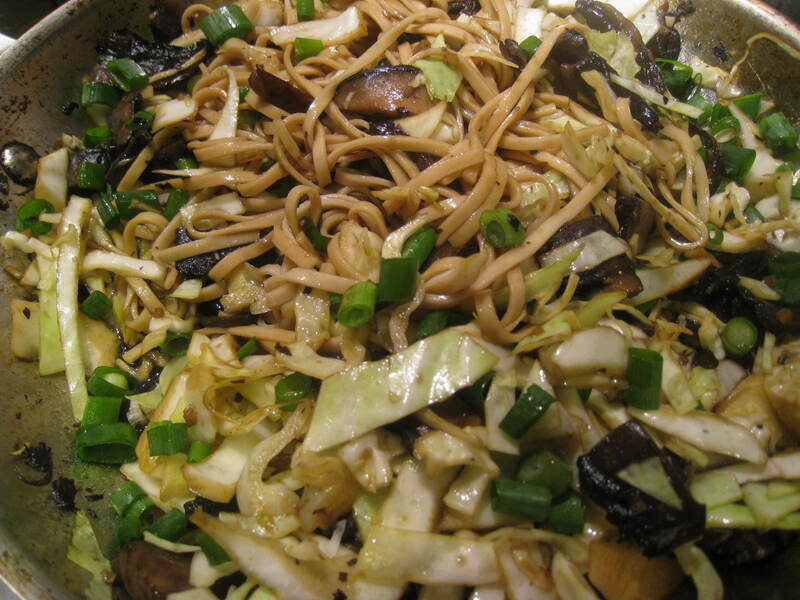 Last night I made soy-ginger udon noodles with mushrooms … and tofu. 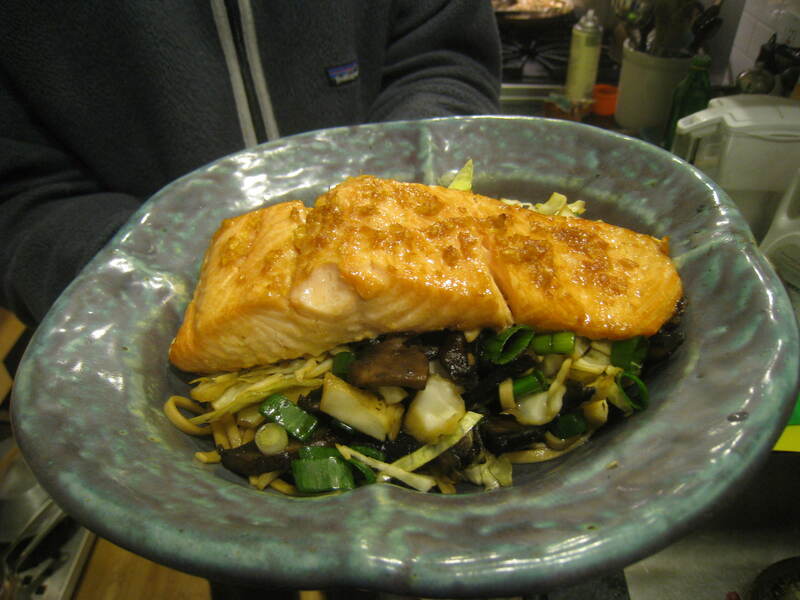 I have often served the Asian noodles topped with roasted salmon, and that’s been a hit. But because my ultimate goal here is to find or develop great vegetarian (rather than pescatarian) dishes, I’ve been trying to create a version with fried tofu. For my first attempt I bought cubes of fried tofu from my local Whole Foods. They were tasty and not too fried, so they didn’t sit like lead in your stomach. But they were also big — so big you couldn’t comfortably get some noodles and a whole cube of tofu into your mouth at the same time. For my second attempt, I thought I’d just fry up the tofu at home. I diligently pressed the tofu to squeeze out the water, sliced it, heated up a few tablespoons of peanut oil, and tossed the little cubes into the pan. 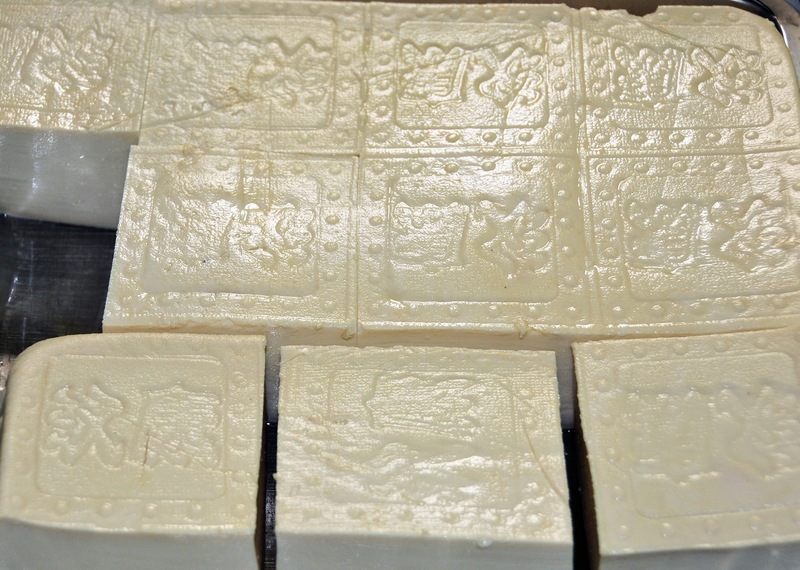 “It will take a few minutes for the tofu to turn golden,” Deborah Madison had advised. So I cleaned some mushrooms while they began to fry. When I turned back to the stove to flip the cubes, I found they were sticking to the pan. Hot oil was spattering, the baby was crying, and eventually I ditched my tongs for a metal spatula and began scraping the little cubes off of the pan’s surface. Was the pan too hot — or not hot enough? Had I not dried the tofu off enough? Or should I have just used a non-stick pan? I don’t yet know. On the positive side, the slight crunch of the somewhat overcooked tofu added a nice texture to the dish. That said, next time I think I’ll try baking it. Last night I cooked rice and beans, though I didn’t realize it until after the fact. And neither did The Professor. I’d decided to try a recipe from one of the cookbooks I’d borrowed from my mother. 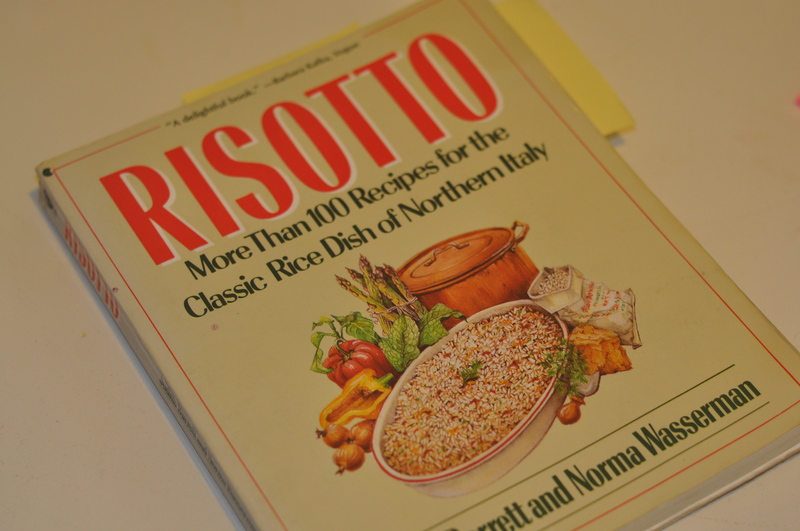 The cookbook was Risotto: More than 100 Dishes for the Classic Rice Dish of Northern Italy,by Judith Barrett and Norma Wasserman. 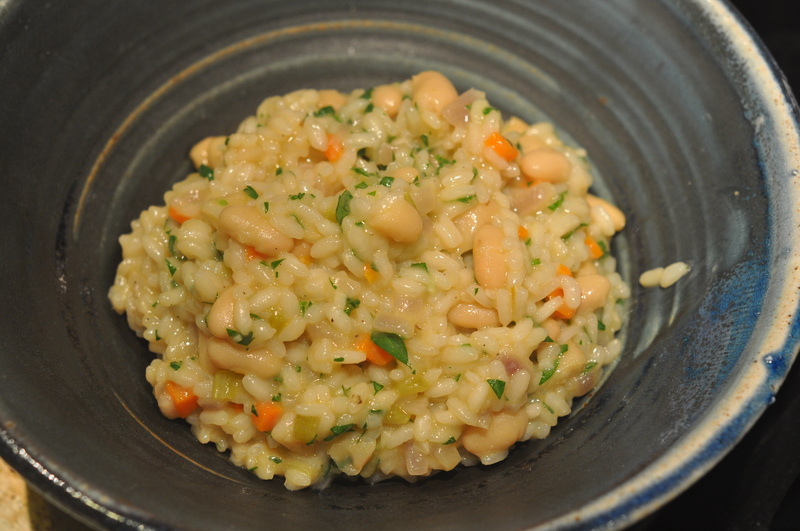 The recipe I’d picked out was called “Risotto con Fagioli,” and when asked what was for dinner, I told The Professor that I was cooking a bean risotto. Risotto, one of the cookbooks pilfered from my mom's collection. “It’s an experiment,” I added, as I saw his brow begin to rise. “So I see,” he replied. The recipe called for a “soffritto” (Italian for the things you saute that will add flavor to the rice) of onion and tomato. I skipped the tomato and used onion, garlic, carrots, and celery. I also added a whole can of cannellini beans, roughly double what the recipe called for. The result? See for yourself. 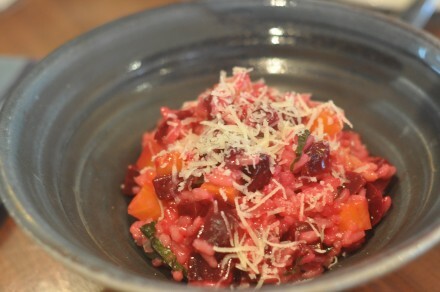 Risotto con Fagioli, aka "Rice and Beans, Italian-style"
“It had more flavor than I expected,” The Professor admitted. He suggested increasing the amount of onion next time, and adding something crisp — perhaps slices of zucchini, tossed in at the last minute — to play against the soft texture of the beans and rice. But all in all, he was satisfied. Since he doesn’t grade first-time dishes, I’ll have to wait until next time to find out whether it was satisfying enough to earn an A.
Superfoods. If you’re into eating well, then you’ve likely already heard all about these ridiculously nutritious, often cancer-fighting grains, fruits, and vegetables. Many are fairly ordinary: oatmeal, blueberries, and spinach. Kale is one of the less common superfoods, at least in American kitchens. That might be because curly kale, the variety most often found on grocery shelves in this country, is a bit tough and slightly bitter. Tuscan kale (aka cavolo nero, dinosaur or lacinato kale) is sweeter. Though as part of the kale family, it’s passed over by most home cooks and greeted with suspicion by most American eaters. In short, it’s the kind of vegetable that The Professor would resist on the theory that anything that healthy can’t possibly taste good. “That was actually pretty good,” The Professor said on the drive home. I filed his comment in a mental folder and, a few weeks later, made the dish at home. He ate it, and within a few months, Mom’s kale pasta had become a semi-regular meal. If I got the kale/garlic balance right, even Ella, my three-something, ate it. Yet … The Professor didn’t love it. It still left him wanting … something. He gave it a B. So I thought about what I could add that would make the dish a more satisfying meal. Nutritionally, the dish lacked any substantive protein, so I decided to try adding nuts and cheese. 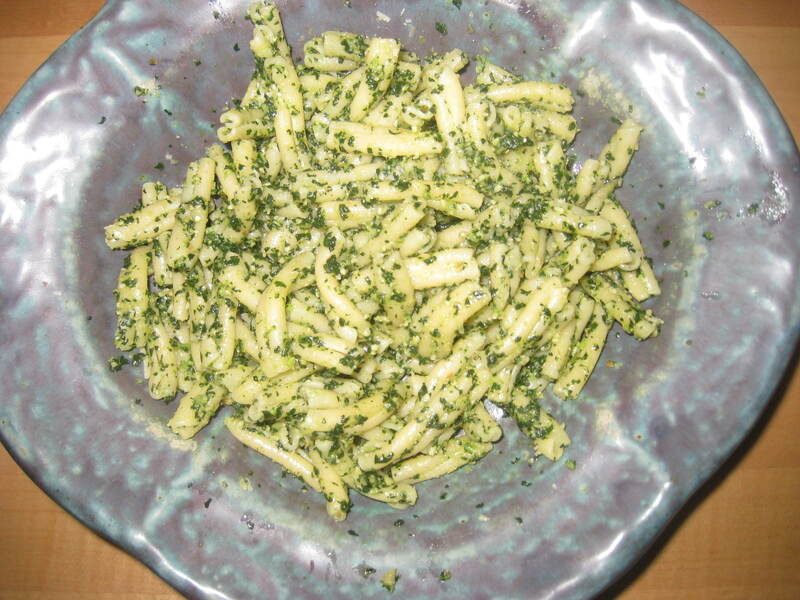 I dug out my Mom’s pesto recipe, and replaced the traditional basil and pine nuts with blanched kale and walnuts. And last night, I cooked it. It was, indeed, better than the original recipe for kale pasta. But a home run it wasn’t. I knew the grade before The Professor even said it: B+. 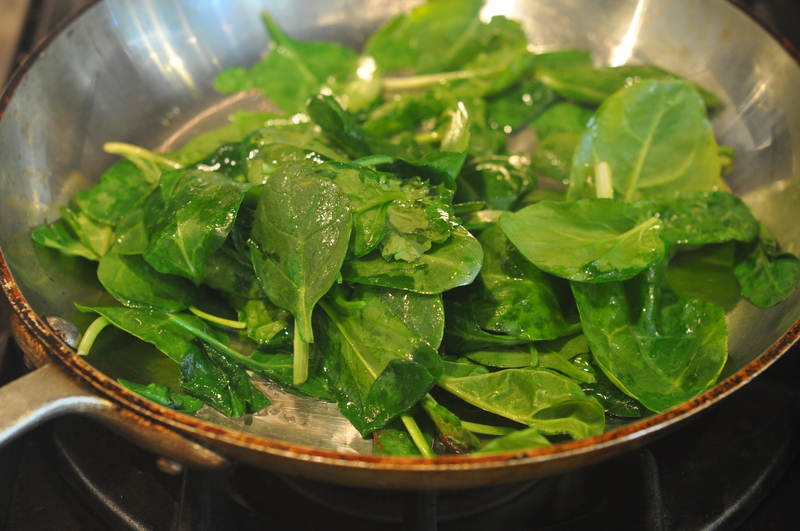 Bring a big pot of water to boil and blanch the kale and 1 clove of garlic for about three minutes. 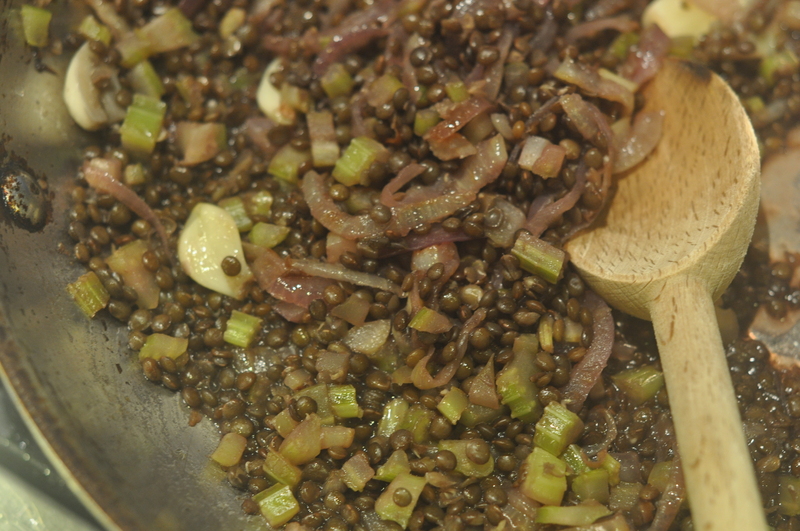 Use tongs to remove the kale and garlic (you’ll be using the water to cook the pasta) and drain well. When it is cool enough to handle, squeeze out the excess water. In a food processor puree the kale, both garlic cloves, the walnuts and the 1/3 cup of olive oil. Add salt and pepper to taste. 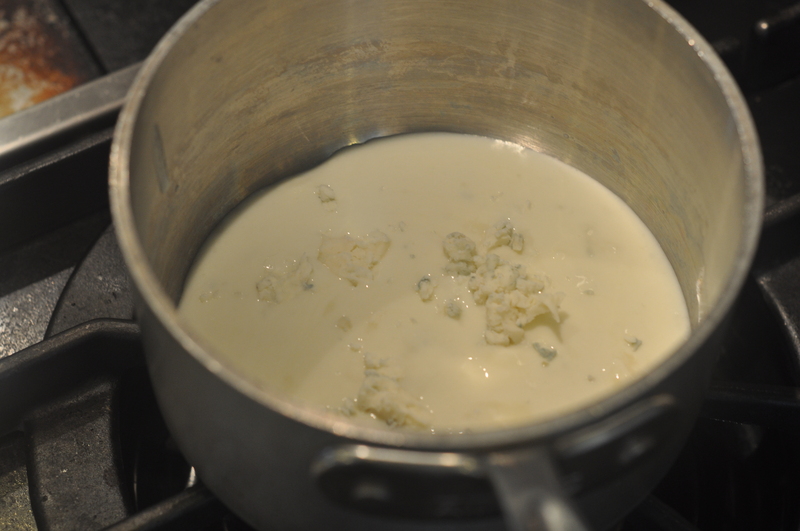 In a bowl combine the kale mixture with the cheese and add salt and pepper to taste.